**Smashbomb asked me to give their site an honest review in exchange for some exposure/partnership. The thoughts expressed here are my own. ** It should also be said that the photos on this post are screenshots I took of the website. What the heck is Smashbomb? Smashbomb is a review site that is cultivating a community where you can review just about anything. To read more about what Smashbomb is about click here to go to their about page. I first joined Smashbomb in February of 2018 from a sponsored Facebook ad. Honestly, I’m not sure why I clicked on it, but I was happy that I took a chance and went to the website. Smashbomb has a pretty interesting concept where you can review just about anything. There is a review section for Books (my favorite), Movies, TV Shows, Podcasts, Apps, Games, Technology, music, basically anything you want, you can review on Smashbomb which is AWESOME but also daunting. With having so many things to rate, it can become a little overwhelming, but if you follow the right people (ones that you share an interest with), you’re sure to find your niche. I know that personally, I love the book reviews area of Smashbomb (I know, shocker!). One thing that I absolutely love is that you have to earn Kudos Points (KP). You can earn these points for doing a variety of activities that vary from logging in daily to adding new books. You can also receive them by having another user award them to you which is a little hard at times because users only have a specific daily amount to grant. This means that you strive to write the best review to get KP which comes in handy because it’s a way to continually help yourself improve. Another great feature that Smashbomb has is the Giveaways! I am a sucker for a good giveaway, and it seems that there is always something new in the giveaway section! You can win anything from a video game to a book to a movie. There is something for everyone! Some of the giveaways do require having a certain level of KP points too, so there is another reason to earn those! And finally, the last thing that I LOVE about this review site is the badges. As you can see, I have a Smashbomb badge on my website (side panel and on my about me page). I LOVE badges. It’s a weird quirk I have. I just can’t wait to earn a new badge. It’s like decoration for my website & for my profile! With all that I like about Smashbomb, this wouldn’t be a proper review without stating some of the areas that drive me nuts about the site as well. As I have already noted, I joined in 2018, so I have been on this site for over a year. I will admit, I’ve fallen off the Smashbomb train for a while because it became daunting to have to add all of the books I have read. The database is tiny, and it seems that every book I have read needs to be added to the website. That becomes daunting, and sometimes when I’m already reviewing on Amazon, Barnes & Noble, Goodreads, and Bookbub, Smashbomb gets left behind. With having a database that is user uploaded, I find that the majority of books only have 1-2 reviews. This means that Smashbomb isn’t going to be replacing Goodreads as my go-to place for book reviews yet. 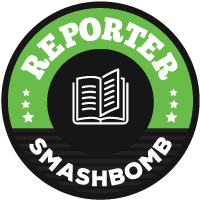 I love being able to see other users reviews, so I’m hoping that with more publicity, Smashbomb will be a great place to find new books! I also wish that it had a more substantial amount of daily users. It seems that Smashbomb doesn’t have the user interaction that other sites have. Something that I LOVE about Goodreads is the interaction with other users. I think this is more on me though and not Smashbomb. I haven’t cultivated my feed yet. Though I do have somethings that I wish would be improved, I really enjoy using Smashbomb. I cannot wait until their databases are larger & they have more reviewers in the book area. All in all, I love the concept and can’t wait to see this website grow! I definitely suggest that you check it out! You can find me at Smashbomb here!